The United Nations has received “troubling reports” that cluster bombs have been used on civilian areas in the capital of Yemen this week and warned that the use of such indiscriminate weapons could be a war crime, a U.N. spokesman said on Friday. “The Secretary-General (Ban Ki-moon) is particularly concerned about reports of intense airstrikes in residential areas and on civilian buildings in Sanaa, including the Chamber of Commerce, a wedding hall and a center for the blind,” U.N. spokesman Stephane Dujarric told reporters. Human rights groups have accused the Saudi-led coalition of using cluster munitions in Yemen. While Dujarric did not identify precisely who might have deployed the cluster bombs, he noted that it is the Saudi-led coalition that has been using warplanes in the conflict. The coalition officially ended a truce for Yemen on Saturday due to what the Saudis said were violations of the ceasefire by Iran-allied Houthi rebels. Yemeni troops loyal to former President Ali Abdullah Saleh are fighting alongside the Houthis. The recently ended ceasefire began on Dec. 15 in tandem with a new round of U.N.-brokered peace talks. 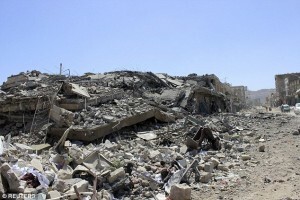 Nearly 6,000 people have been killed since the coalition entered the conflict last March, almost half of them civilians. He said the U.N. chief was urging all parties to the Yemen conflict to cooperate with his special envoy Ismail Ould Cheikh Ahmed in order to resume peace talks as soon as possible. While Riyadh sees the Houthis as a proxy for bitter regional rival Iran to expand its influence, the Houthis deny this and say they are fighting a revolution against a corrupt government and Gulf Arab powers beholden to the West.